The second article of ‘how-to’ in the BrakeSteerTurn (BST©) series. Counter steering is a method utilized by two-wheeled, inline, single track vehicles; bicycles and motorcycles. Counter steering is used to initiate lean into a turn. Lately I have been reading up on road cycling articles and watching cycling videos on the subject of bike handling and descending skills. So as a current rider and former moto racer I have a genuine keen interest in the topic and I am curious as to the latest information being doled out. I figure perhaps there is something I could glean as well, heck I’m always open to learning something as long as it is both credible and valuable. Though lately what I have been reading and seeing is a bit frustrating. Some bits from so-called ‘experts’ is really a mix of good advice but with a bit of incorrect advice as well. I’m not going to point out any specific Bicycling type magazines, the so-called coaches-experts or the various global video channels that are purporting some of this misguided info, but suffice to say, there are more than a few top line publications and cycling sites that are doling out some poor advice and somewhat questionable opinions on bike handling and descending skills. In fact there are even a few misguided ex-pros who claims that you don’t need to counter steer at all! *Below is an prime example of not only a naive view but what amounts to an unschooled understanding of two-wheeled vehicle dynamics. Consequently this is very misleading and dangerous advice to be giving out, especially from a former pro rider! Okay, so let’s dive in and point out what I know from first-hand experience to be incorrect regarding two-wheeled steering dynamics. There seems to be much confusion about steering a bicycle (or motorcycle for that matter). Often this confusion results in compromised control, which leads to either poor cornering technique and-or a crash. Simply believing or thinking that one can properly steer a bicycle with just body lean or a shift in body weight alone is absolutely false. But apparently this has become the popular narrative, but I assure you, it is a False Narrative. And as far as where to put a riders hands or where to steer from, the popular opinion that a riders hand must always be in the drops is another misleading statement. In fact, a rider actually has more leverage in the hoods than in the drops. Where to place your hands or steer from is simply a personal preference, but when a rider is in the drops, a rider is placing more weight on their hands, wrists and shoulders- as weight is being shifted forward (and so to, the Center of Mass, debunking yet another ‘theory’ that riding in the drops “lowers the center of gravity” which is mostly rubbish. Because whether in the drops or in the hoods, the center of mass is not much affected by hand position, but rather by body position. And furthermore, getting your shoulders a couple of inches ‘lower’ only very slightly affects CoM by actually moving the Center of Pressure. But for the average rider, this extra weight on the wrists/arms/shoulders could result in less control, especially over long rides when fatigue sets in. Next time you head out for a ride, try counter steering in an area that is free from traffic. In the drops make firm inputs to the bars. Do this a few times or as many times as you want. Then do the same in the hoods. Note your observations. The idea that a rider can properly steer a bicycle at any speed other than very low speeds by just utilizing body weight and using only body lean is one giant myth (busted by the way). Counter steering always works, just push on the bar and bike responds Instantly, each and every single time. This allows the rider to have more control, resulting in safer riding conditions. Now that is not to say that body lean isn’t a worthy technique, when combined in conjunction with counter steering. 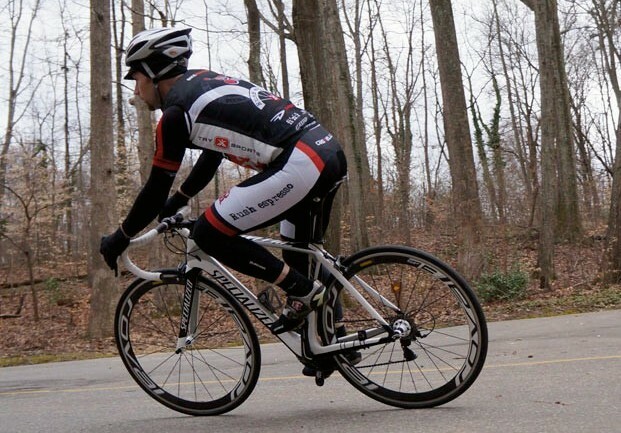 Body lean is merely a component in the bike handling mix, but it is not the sole skill. I have and still advocate using the shoulders and hips to aid in turning-cornering, but the main component of cornering is to employ counter steering. If a rider just utilizes body lean a rider will more often than not, run wide and will usually miss the apex and subsequently raise the risk of crashing, especially as speeds increase. Have you ever wondered why many riders including some of the pro’s run wide or run off the edge of the road or crash in a turn? Well, barring an obstacle, it is usually a result of compounding factors. The first is they typically start their turn-in too early, they typically use just their body to try and make the turn instead of counter steering and once they begin to run wide, they then succumb to Target Fixation. Now there are some exceptions, some of the best pro riders like Sagan, Nibali, Cancellara and other great bike handlers/descenders understand and utilize counter steering and that is what separates them from the rest (even if it is a sub-conscience move) Yes, steering is very light on a bicycle and that causes most riders to have difficulty in separating the lean of their body with the very slight effort it takes to counter steer. Praising the virtues of Body Steering as it is sometimes called, counter lean, –that is ‘steering’ without counter steering is dangerous. If the turn or series of turns are decreasing in radius, then a rider will simply miss the apex and run off the road or at the very least run wide. If a rider uses just the ‘body lean’ technique, the rider will experience a momentary lag from body input to actual movement on the bicycle, as in the bike won’t do what the rider wants it to do, at the exact moment when the rider expects it to. So, if a rider needs to initiate an avoidance maneuver or a quick, sharp turn, the rider will most likely end up in a heap or at least crossed up. If a rider is confronted with a obstacle from road hazards or other riders and is not able to initiate firm and concise counter steering, more than likely, the rider will be unable to avoid said obstacle(s). If a rider relies on just using body lean most of the time, when that critical moment arrives and quick, firm counter steering is necessary, it won’t be an automatic reaction, instead, survival reactions (freezing up, tightening the grip on the bars along with target fixation) will all take over and that could and will probably be disastrous. I defy anyone to descend and-or corner very quickly and just use body lean or counter lean alone. Try it. Keep your hands on top of the bars without pushing on the bars. Just rest them on the bars and go attack your favorite corner or descent. You can get back to me after the body cast and bandages are removed. Or if perhaps the consequences were worse. The fact that so-called experts are telling and propagating to utilize just the body lean technique to steer in a descent is down right dangerous and just irresponsible in my experienced riding opinion. Safe and efficient riding starts with practicing proper techniques and understanding the dynamics. This article and material is protected by copyright. All rights reserved. Please contact the publisher for permission to copy, distribute or reprint. 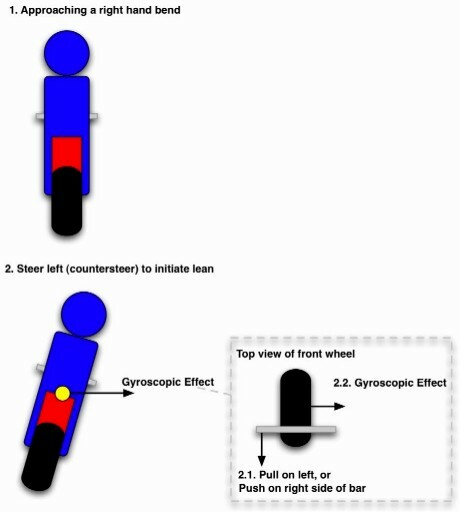 This entry was posted in Cornering and tagged Amazon, bicycle handling techniques, Bike handling Skills, braking techniques, Counter Steering, descending and cornering on bike, descending on a bicycle, descending skills, GCN, global cycling network, how to counter steer a bicycle, How to descend on a bicycle, road cycling, Steering a bicycle. Bookmark the permalink.